The University of Florida Student Association for Fire Ecology (SAFE) is a local chapter of the Association for Fire Ecology SAFE program. I founded the UF SAFE chapter in 2007 after recognizing the need for an organization that would bring together the many graduate and undergraduate students from across campus that were interested in and studying fire. I served as chapter president for the first year and a half. During that time membership in the organization expanded, members participated in prescribed fires, the UF SAFE list-serve was created, and the chapter held its first ever “UF Prescribed Fire Awareness Day“. This event, held annually in March ever since, brought SAFE members to the campus union dressed in nomex to share their fire ecology knowledge and experiences with fellow students. 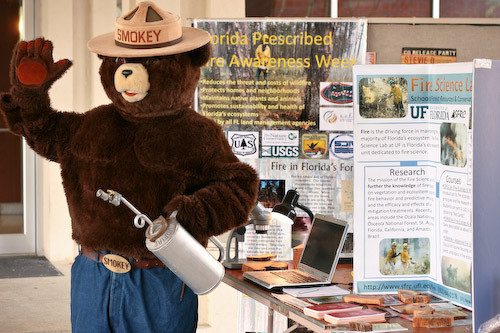 Since 2007, UF SAFE has produced two Florida themed fire ecology calendars, a chapter t-shirt, coordinated pack- tests with local officials, presented at prescribed fire council meetings, and actively participated in prescribed fires with local agencies. I continue to run the UF SAFE list-serve, an active email system with over 80 members for students and faculty to share information regarding training opportunities, chapter activities, and research assistantships related to fire. If you’re interested in joining the list-serve see the UF SAFE Google Group. Throughout my involvement with the UF SAFE chapter, I was often asked for information regarding training opportunities related to wildland fire and prescribed fire. In September 2009, I started the website “Florida Wildland Fire Training” as a clearinghouse of training and other information for those interested in wildfire and prescribed fire in Florida. The purpose of the site was to share training opportunities from various state, federal, and non-profit agencies, prescribed fire council meetings, and anything else of interest to the community. Since starting in 2009, the site has had over 100 posts and 31,000 visits. Updates to the website were discontinued in April of 2013 and the “www.floridawildlandfiretraining.com” domain name released as the Southern Fire Exchange and the Southeast Prescribed Fire Update blog began aggregating and disseminating fire training information and opportunities. The Association for Fire Ecology is the primary professional organization linking academics, researchers, and practitioners interested in fire ecology and fire science. I have been an active member of AFE since 2007 and have attended and presented at several AFE regional conferences and two international conferences. I have both reviewed and published in the AFE open-access journal Fire Ecology. In 2011 and 2012 I served as the student representative on the AFE Education Committee and as the previous newsletter designer for the Southeastern Section of the association. The Scouting program has had a profound impact on my life. The experiences, activities, friends, and leaders of Scouting have greatly shaped my values and interests as an adult. As an Eagle Scout, I am committed to maintaining an active role in the organization that has had such a positive impact on myself and countless others across the country and world. As a youth through the Order of the Arrow service program, I served on both the Northern Tier and Philmont trail crews. In 2002, I returned to Philmont to spend an unforgettable summer as a Ranger and Rayado Ranger. I’ve since maintained ties to Scouting through involvement with my former troop and serving as the chairman of the Suwanee River Area Council Conservation Committee. The Conservation Committee is tasked with providing guidance and expertise in the management and restoration of the 500 acre Council camp property. Since establishment in 2013, our committee has revamped and certified the decades-old land management plan, planned and executed the first ever camp property timber harvest and fuel-wood removal cut, initiated the process of enrolling in federal cost-share programs for land conservation, and developed outside partnerships to secure external grant funding for the establishment and restoration of native longleaf pine on the property. In addition, the committee has been awarded a NFPA FireWise / State Farm 2015 National Wildfire Preparedness Day grant to support training adult Scout Leaders in FireWise / Fire Adapted Community concepts and techniques. See a video of the project and a short summary from the NFPA. I’ve also written detailed prescribed burn plans for and led two successful prescribed fires on council property. One of which resulted in a short outreach video designed to stimulate interest in the role of prescribed fire in forest management. In 2014 I was invited to return to Philmont Scout Ranch in northern New Mexico to serve as a Visiting Forester (short video here). While there, I had the opportunity to give field lectures and demonstrations to over 700 Scouting youth, adults, and staff members from across the country and around the world. It was a wonderful experience and a great chance to explain the roles of fire and forest management in the ecosystems that the crews were hiking and camping in. In addition, I had the opportunity to give an invited lecture to over 50 staff members on fire ecology and fire management in the West.